The Gachet Salon Shop is a small exhibition space featuring work by our Collective members and other volunteers. Work presented in the shop changes regularly and varies widely, including paintings, photography, sculpture, prints and art cards. Proceeds are shared between the artists and the gallery. The shop is open during our regular gallery hours, 12-6pm Wednesday through Sunday*. 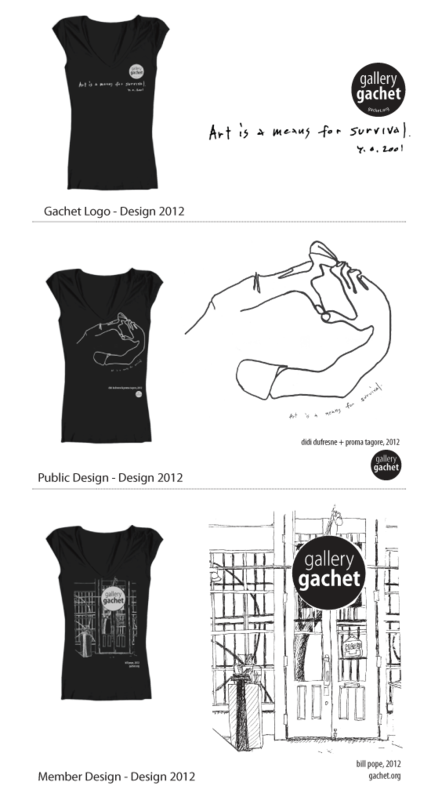 **NEW** 2012-2013 T-Shirt Designs are here! We are now selling t-shirts featuring designs from Gachet Member Bill Pope and Vancouver artists Didi Dufresne and Proma Tagore. We have unisex and women’s tees available on a sliding scale for $20-25. Come by the Gachet Salon shop today and get one of these great designs! *During our regular exhibition times. Please refer to our exhibition schedule for exact dates.